Julia ‘Jiu-Jiu’ Johansen writes a lovely BJJ blog, which she began in the summer of 2010 when she met BJJ and fell head over heels. I first ran across Julia’s tales of a BJJ grrl in Korea with this open-hearted tale of her first BJJ competition and have enjoyed her posts ever since. Your nickname is a badass leader of the Decepticons in Transformers … Plus, you come in standard mode and BATTLE MODE! Holy H-E-Double-Hockey-Sticks! 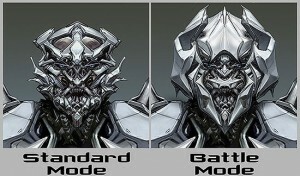 Standard mode and battle mode? Now we’re talking! I normally consider myself a Soldier of the Light, or at least I try to keep my dark side in check, but I can’t say I’m not psyched by my fellow Megatronian’s chimeric qualities! So, what’s your BJJ nickname? Why not shoot on over to Julia’s blog, leave a comment, and help her create a name with just the right balance of sassy and sweet. Way back when I started BJJ under Pedro Bessa I got landed with "Sakuraba" He even put it on my blue belt certificate. I'm not complaining. Yes! Thank you for the pimpage, Decepticon leader! 😉 I feel the love! I am rife with positivity and enthusiasm! Actually, it's what's always marked on my evaluations at work: Julia is passionate and enthusiastic. Glad it shows in my BJJ blog! 🙂 I hope to meet you, too! Hopefully I'll get my BJJ vacation in to England! That would be cool! Thought about going this year, but don't think I'll have the knee-fitness to compete so probably won't make the journey. You never know. If we don't meet you in Texas, though, how are we going to score some amazing Georgette cuisine?! I could only hope to one day earn the title of "Megatron" on the mats (it's already what a couple friends call me. I'm a definite fan of Optimus myself(Prime was one of my first crushes), but Megatron hold some serious weight. Indeed, I hadn't realised the badass pedigree of the name; I've got a long way to go to live up to it too! Megan gave me the awesome nickname Jiu-Jiu, which works on a few levels–first, easy peasy for Koreans to say, second, it has a hidden JIU JITSU meaning, third, it TOTALLY works with my name! So now I need to propagate this nickname!